Monday March 5th 1894 Josie and I began work on the north bed room this morning. We got it papered by noon. In the afternoon we put down a carpet in there and one in Leonards room up stairs. Will went out west of town to see about getting his hogs and brought Old Pet home. he had a great time with her and made his leg worse. weather pleasant. Tuesday March 6th 1894 We papered the south bed room in the forenoon and Will & Leonard cut down the big tree east of the house. Will and I went to town in the waggon in the afternoon the roads were very bad. We got the carpets and a few things left at the house and some more paper. Josie sewed on the dining room carpet while I was gone and in the evening we finished it. 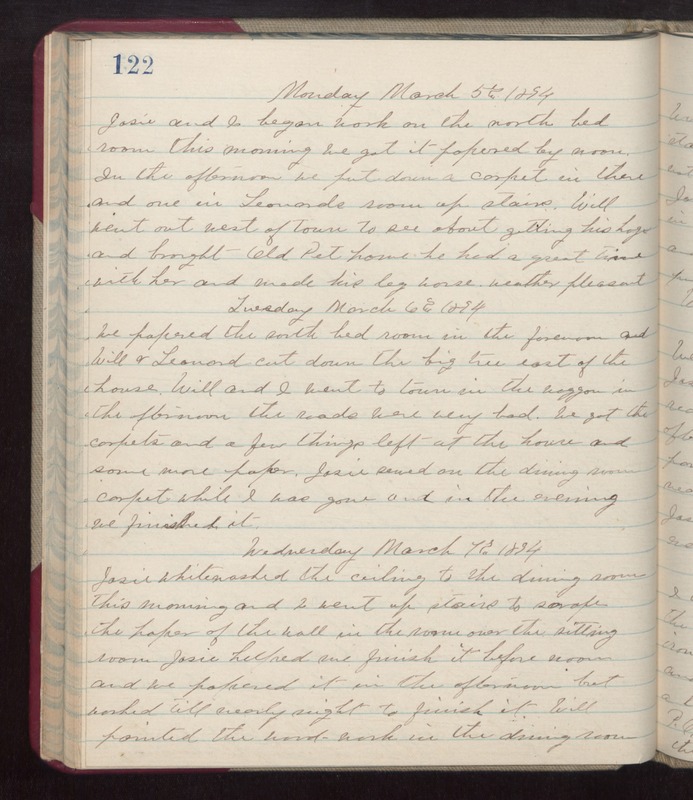 Wednesday March 7th 1894 Josie whitewashed the ceiling to the dining room this morning and I went up stairs to scrape the paper of the wall in the rooms over the sitting room. Josie helped me finish it before noon and we papered it in the afternoon but worked till nearly night to finish it. Will painted the wood-work in the dining room.